Interferon regulatory factor 8 (Irf8) is a transcription factor that negatively regulates osteoclast differentiation and Irf8 global knockout (Irf8 −/−) mice have been shown to have reduced bone volume resulting from increased osteoclast numbers. However, detailed analysis of the functions of Irf8 in osteoclast precursors with a monocyte/macrophage linage is difficult, because the population and properties of hematopoietic cells in Irf8 −/− mice are severely altered. Therefore, to clearly elucidate the functions of Irf8 during osteoclastogenesis, we established myeloid cell-specific Irf8 conditional knockout (Irf8 fl/fl ;Lyz2 cre/+) mice. We found that trabecular bone volume in the Irf8 fl/fl ;Lyz2 cre/+ mice was not significantly affected, while exposure to M-CSF and RANKL significantly increased TRAP activity in vitro in osteoclasts that underwent osteoclastogenesis from bone marrow-derived macrophages (BMMs) induced from bone marrow cells (BMCs) of those mice by addition of M-CSF. Our results also showed that expression of Irf8 mRNA and protein in BMMs obtained from Irf8 fl/fl ;Lyz2 cre/+ mice and cultured with M-CSF was reduced. These findings predicted that Lyz2/Lyz2-cre expression is induced when BMCs differentiate into BMMs in cultures with M-CSF. In osteoclast differentiation cultures, Lyz2 was gradually increased by M-CSF during the first 3 days of culture, then rapidly decreased by the addition of RANKL with M-CSF during the next 3 days. Furthermore, BMCs differentiated into osteoclasts while maintaining a low level of Lyz2 expression when cultured simultaneously with both M-CSF and RANKL from the initiation of culture. These findings suggest that Lyz2-cre expression is induced along with differentiation to BMMs by BMCs obtained from Irf8 fl/fl ;Lyz2 cre/+ mice and cultured with M-CSF. In addition, Irf8 was down-regulated by activation of the cre/loxP recombination system in BMMs and osteoclastogenesis was accelerated. Based on our results, we propose the existence in vivo of a new lineage of osteoclast precursors among BMCs, which differentiate into osteoclasts without up-regulation of Lyz2 expression. The online version of this article (doi: 10.1007/s10616-016-0013-z) contains supplementary material, which is available to authorized users. The strength and health of bone tissues are regulated by a tight balance of bone resorption by osteoclasts and bone formation by osteoblasts. When that balance is destructed along with enhanced osteoclast and/or failed osteoblast function, bone develops osteopenia or osteoporosis, which is associated with a high risk of fracture. Osteoclasts are differentiated from osteoclast precursors with a monocyte/macrophage lineage following stimulation with macrophage colony-stimulating factor (M-CSF) and receptor activator of nuclear factor-κB ligand (RANKL), which are secreted from osteoblasts and osteocytes (Kobayashi et al. 2009; Nakashima et al. 2012). Osteoclast differentiation and activation are strictly controlled by various transcription factors, including AP-1 (Fos/Jun) and nuclear factor of activated T cells c1 (NFATc1), which are activated by RANKL signaling. Differentiated osteoclasts express several specific markers, including tartrate-resistant acid phosphatase (TRAP) and cathepsin K, a cysteine protease. We previously reported that interferon regulatory factor 8 (IRF8), a transcription factor otherwise known as interferon consensus sequence binding protein (ICSBP), negatively regulates osteoclast differentiation (Zhao et al. 2009). Irf8 is expressed in osteoclast precursors and inhibits Nfatc1 function, and is down-regulated by stimulation with RANKL, which leads to Nfatc1 auto-amplification and osteoclast differentiation. Furthermore, Irf8 global knockout (Irf8 −/−) mice show reduced bone volume as a result of increased numbers of osteoclasts. The population and properties of hematopoietic cells in Irf8 −/− mouse bone marrow and spleen tissues are dramatically changed, along with development of chronic myelogenous leukemia and splenomegaly (Holtschke et al. 1996; Tamura et al. 2015; Tamura and Ozato 2002), thus it is difficult to clearly analyze the functions of Irf8 in monocytes/macrophages in the osteoclast precursor stage. In the present study, to investigate the detailed functions of Irf8 in monocytes/macrophages during osoteoclastogenesis, we established myeloid cell-specific Irf8 conditional knockout (Irf8 fl/fl ;Lyz2 cre/+) mice by crossing Irf8-flox with Lyz2-cre mice, and analyzed bone phenotype and osteoclast differentiation. All animal experiments were conducted in accordance with the guidelines of Showa University. The Irf8 knockout (Irf8 −/−) mice (C57BL/6) used in this study have been described (Holtschke et al. 1996). Myeloid cell-specific Irf8 conditional knockout (Irf8 fl/fl ;Lyz2 cre/+) mice (C57BL/6) were generated by mating Irf8-flox with Lyz2-cre knock-in mice (Clausen et al. 1999; Feng et al. 2011). The primers used for genotyping are shown in Table S1. Following euthanasia, tibiae were dissected and subjected to three-dimensional micro-computed tomography (μCT) with a ScanXmate-L090H (Comscan Tecno, Yokohama, Japan). Three-dimensional microstructural image data thus obtained were reconstructed using TRI/3D-BON software (Ratoc System Engineering, Tokyo, Japan). Mouse bone marrow cells (BMCs) were collected from the femora and tibiae of 6- to 8-week-old male mice. 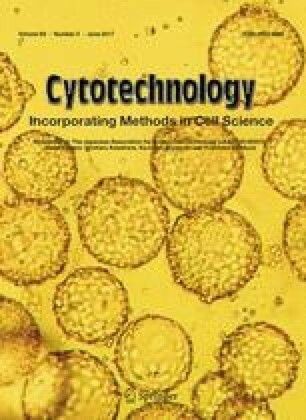 Bone marrow-derived macrophages (BMMs) were formed from BMCs cultured in α-MEM supplemented with 10 % fetal bovine serum and M-CSF (50 ng/mL) for 3–4 days at 37 °C in a CO2 incubator (5 % CO2, 95 % air). Osteoclasts were formed from BMM (or BMC in Fig. 3c, d) cultures with M-CSF and various concentrations of RANKL after 3–4 days. Human M-CSF (Leucoprol) and RANKL was purchased from Kyowa Hakko Kogyo (Tokyo, Japan) and R&D Systems (Minneapolis, MN, USA), respectively. After culturing, cells were fixed with formalin and stained for tartrate-resistant acid phosphatase (TRAP; osteoclast marker) using a conventional method with naphthol AS-MX phosphate (Sigma-Aldrich, St. Louis, MO, USA) and fast red violet LB salt (Sigma-Aldrich) dissolved in 0.1 M acetic buffer (pH 5.0) containing 1 % tartrate acid (Suda et al. 1997). To evaluate the generation of osteoclasts, we used a TRAP activity assay, as previously described (Mochizuki et al. 2006). Cells were lysed in RIPA buffer and quantified using a BCA Protein Assay Kit (Thermo Scientific, Waltham, MA, USA). SDS-polyacrylamide gel electrophoresis sample buffer was added to protein samples (30 μg), followed by boiling for 5 min. Next, the samples were loaded onto pre-cast gradient Mini-PROTEAN TGX Gels (Bio-Rad Laboratories, Hercules, CA, USA), then separated and transferred to PVDF Immobilon-P membranes (Merck Millipore, Billerica, MA, USA) using a Mini Trans-Blot Cell system (Bio-Rad Laboratories). The membranes were blocked in 5 % BSA Tris-buffered saline-Tween 20, incubated with primary antibodies according to the supplier’s instructions, and incubated with appropriate HRP-conjugated secondary antibodies prior to signal detection with SuperSignal West Substrate (Thermo Scientific) using a VersaDoc Imaging System (Bio-Rad Laboratories). The antibodies used in the present experiment were as follows: anti-Irf8 antibody (Icsbp) #sc6058 (Santa Cruz Biotechnology, Santa Cruz, CA, USA), anti-β-actin antibody #A5060 (Sigma-Aldrich), anti-goat IgG-HRP #sc2768 (Santa Cruz Biotechnology), and anti-rabbit IgG-HRP #7074 (Cell Signaling Technology, Danvers, MA, USA). Total RNA was extracted with TRIzol reagent (Invitrogen, Carlsbad, CA, USA), then reverse-transcribed using ReverTra Ace qPCR RT Master Mix (TOYOBO, Osaka, Japan). Quantitative real-time PCR (qPCR) was performed using THUNDERBIRD SYBR qPCR Mix (TOYOBO) and the StepOne Real-Time PCR System (Applied Biosystems, Foster City, CA, USA). The primer sequences were as follows: Actb, 5′-AGATGACCCAGATCATGTTTGAGA-3′ and 5′-CACAGCCTGGATGGCTACGT-3′; Irf8, 5′-GGTGGATGCTTCCATCTTCAA-3′ and 5′-GTGGCTGGTTCAGCTTTGTCT-3′; Ctsk, 5′-CGACTATCGAAAGAAAGGATACGTT-3′ and 5′-AGCCCAACAGGAACCACACT-3′; and Lyz2, 5′-AATGGCTGGCTACTATGGAGTCA-3′ and 5′-TGCTCTCGTGCTGAGCTAAACA-3′. Expressions were normalized to that of Actb. The results are expressed as the mean ± SD for each experiment. Student’s two-tailed t test was used, with p < 0.05 considered to indicate significance. We initially evaluated the bone morphology of Irf8 fl/fl ;Lyz2 cre/+ mice, for which tibiae from proximal sides of 8-week-old males were analyzed using μCT. As we previously reported, trabecular bone in Irf8 −/− mice was found to be sparse (Fig. 1a) and bone volume per tissue volume (BV/TV) of tibia trabecular bone in those mice was reduced by approximately 50 % as compared to that of wild-type mice (Fig. 1b). On the other hand, as compared to the control group (Irf8 fl/fl or Irf8 fl/+ ;Lyz2 cre/+), trabecular bone in the Irf8 fl/fl ;Lyz2 cre/+ mice was not altered (Fig. 1a) and BV/TV was not significantly changed (Fig. 1b). Furthermore, there were no significant difference in regard to BV/TV between the control group and wild-type mice. In addition, the body weights of the Irf8 fl/fl ;Lyz2 cre/+ mice during development were not different as compared to the control mice, while splenomegaly was observed in the Irf8 −/− but not the Irf8 fl/fl ;Lyz2 cre/+ mice (data not shown). These results suggest that osteoclastogenesis in bone tissues of Irf8 fl/fl ;Lyz2 cre/+ mice is not enhanced in vivo. Next, to investigate the potential of Irf8 fl/fl ;Lyz2 cre/+ mouse BMMs to differentiate into osteoclasts in vitro, we used a conventional osteoclast culture system, in which BMCs were induced to differentiate into BMMs by M-CSF, then the BMMs were differentiated into osteoclasts by addition of M-CSF and RANKL (Fig. 2a). We found that osteoclast formation by BMMs from Irf8 fl/fl ;Lyz2 cre/+ mice was enhanced as compared to the control group, while that by BMMs from Irf8 −/− mice was enhanced as compared to the wild-type mice (Fig. 2b, upper panels). Furthermore, TRAP activity in osteoclasts from the Irf8 fl/fl ;Lyz2 cre/+ mice was significantly increased as compared to the control, while alterations in the Irf8 −/− and wild-type mice were similar (Fig. 2b, lower graphs). Using this culture system, we also evaluated mRNA and protein expression levels of Irf8 using qPCR and western blotting, respectively. Our results showed that Irf8 mRNA expression in BMCs was not significantly different between the control and Irf8 fl/fl ;Lyz2 cre/+ mice (Fig. 2c, day 0), while that in BMMs from Irf8 fl/fl ;Lyz2 cre/+ mice induced by M-CSF was significantly suppressed as compared to the control group (Fig. 2c, days 1–4). In addition, the Irf8 protein expression level in BMMs induced from BMCs of Irf8 fl/fl ;Lyz2 cre/+ mice after 3 days of culture with M-CSF was decreased as compared to the control mice (Fig. 2d). Together, these findings suggest that the progression of differentiation of Irf8 fl/fl ;Lyz2 cre/+ mouse BMMs to osteoclasts in vitro is induced by suppression of Irf8 expression in BMMs caused by the presence of M-CSF in the culture. Our results predicted that Lyz2/Lyz2-cre expression is induced when BMCs differentiate into BMMs in cultures with M-CSF, using a conventional osteoclast culture system, thus we investigated the fluctuation of Lyz2 mRNA expression using qPCR. Those results confirmed that the expression of Ctsk (encodes Cathepsin K; osteoclast marker) was greatly increased, while that of Irf8 was reduced by stimulation with RANKL (Fig. 3a, days 4–6). Therefore, we found that the expression of Lyz2 was gradually increased by M-CSF (Fig. 3a, days 1–3) and rapidly decreased by RANKL stimulation (Fig. 3a, days 4–6). Next, to examine whether osteoclast precursors among BMCs are able to differentiate into osteoclasts without the increased expression of Lyz2 seen in M-CSF-cultured BMMs, we compared BMC cultures between those stimulated with only M-CSF and those simultaneously stimulated with both M-CSF and RANKL from the initiation of culture (Fig. 3b). Those finding showed that TRAP-positive osteoclasts were formed from cultures of BMCs stimulated by both M-CSF and RANKL (Fig. 3c), as well as dramatic time-dependent up-regulation of Ctsk expression in BMCs cultured under that condition (Fig. 3d). Also, BMCs stimulated simultaneously with both M-CSF and RANKL maintained low expression levels of Irf8 and Lyz2 as compared to those cultured with only M-CSF (Fig. 3d). These results indicate that osteoclast precursors among BMCs are able to differentiate into osteoclasts without up-regulation of Lyz2 expression when in the presence of both M-CSF and RANKL from the initiation of culture. In contrast to Irf8 −/− mice, the Irf8 fl/fl ;Lyz2 cre/+ mice did not develop osteoporosis. However, BMMs from the Irf8 fl/fl ;Lyz2 cre/+ mice with a low level of Irf8 expression induced by M-CSF from BMCs in vitro aggressively differentiated into osteoclasts by RANKL stimulation, similar to those from the Irf8 −/− mice. We also noted that Lyz2 expression was up-regulated in cultures with M-CSF, namely, Lyz2 expression in BMMs was higher than that in BMCs. These results suggested that Lyz2-cre was induced along with the differentiation of BMCs from Irf8 fl/fl ;Lyz2 cre/+ mice to BMMs when exposed to M-CSF. Thereafter, loxP-flanked Irf8 DNA was deleted by activation of the cre/loxP recombination system in BMMs from Irf8 fl/fl ;Lyz2 cre/+ mice and osteoclastogenesis induced by RANKL was accelerated (Fig. 4a). On the other hand, this is the first study to show that osteoclast precursors among BMCs differentiated into osteoclasts while maintaining a low level of Lyz2 expression when simultaneously exposed to both M-CSF and RANKL from the initiation of culture. That finding raises the possibility of another osteoclast lineage that differentiates from osteoclast precursors among BMCs and does not express Lyz2/Lyz2-cre, which may be dominant in vivo as compared to osteoclasts with BMM lineage (Fig. 4b). Irf8 mRNA expression was not reduced in BMCs from Irf8 fl/fl ;Lyz2 cre/+ mice and those mice did not demonstrate osteoporosis. Thus, if most osteoclasts differentiate from BMMs in vivo, then Irf8 fl/fl ;Lyz2 cre/+ mice should develop osteoporosis caused by enhancement of excessive bone resorption induced by osteoclastogenesis, the same as seen in Irf8 −/− mice. However, that does not occur in Irf8 fl/fl ;Lyz2 cre/+ mice. A previous study showed that mice obtained by crossing Nfatc1 conditional knockout mice with Lyz2-cre mice had no alterations in bone density (Aliprantis et al. 2008). Nfatc1 is a master regulator of osteoclast differentiation and activated by RANKL, and its transcriptional activity and expression are inhibited by Irf8 in osteoclast precursors (Zhao et al. 2009). In other words, the main portion of osteoclasts in vivo is the results of differentiation from osteoclast precursors under regulations of Irf8 and Nfatc1, without Lyz2/Lyz2-cre expression. However, Lyz2-cre mice have been used in osteoclast differentiation studies, and conditional knockout mice have been found to have such bone phenotypes as osteoporosis (Albers et al. 2013; Martin-Millan et al. 2010) and osteopetrosis (Kenner et al. 2004; Wang et al. 2008). Thus, the process of osteoclast differentiation may be dependent on a combination of between expression level and/or function of each regulator, and two types of osteoclast precursors, those with and without Lyz2/Lyz2-cre expression. Additional studies are needed to elucidate the mechanisms involved. We express our gratitude to M. Benton for his help with our work. We thank H. Morse III (National Institute of Allergy and Infectious Diseases, Rockville, MD, USA) for providing Irf8-flox mice. This study was supported in part by Grants-in-Aid for Scientific Research (B) (MT: 26293398) and (C) (AM: 15K11052) from the Japan Society for the Promotion of Science. The authors have no conflicts of interest to declare in regard to this study.